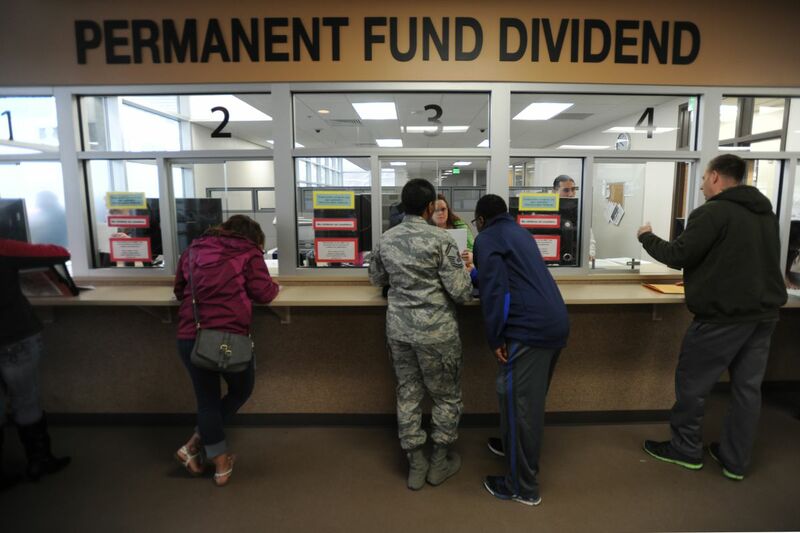 Alaska residents get assistance applying for the Permanent Fund dividend before the filing deadline on Tuesday, March 31, 2015, at the new PFD Anchorage Office in the Linny Pacillo Parking Garage at 7th Avenue and F Street. The most common question I get when I tell people I am from is Alaska is, “Doesn’t the state pay you basically a welfare check to live there?” The short answer I give them is typically “yes,” along with my opinion on the Permanent Fund dividend. It is bizarre to me how the PFD works; a family of 10 can move to Alaska for a year and, on a good year, walk away with a year’s salary for some, with nothing to stop them from collecting their checks and hopping on the next plane out of Alaska. At what point do you draw the line on eligibility? How is it fair to anyone in the great state of Alaska to be used by Outsiders as a paycheck? I can tell you right now: If I were the governor, that would come to an immediate stop. Sure, plenty of people rely on the PFD, such as people who live off the grid and live off the land. That’s fine, give them a PFD; they need it more than anyone else who can readily go to the shopping center at any time and get what they need. These off-the-grid people use the money to provide food for their animals, such as dog teams, so they can live and provide for themselves. If you want my opinion, we should snuff the PFD altogether. It is not Alaska’s responsibility to provide a salary because you live here. If I had it my way, I would give the citizens of Alaska multiple options. If you’re an Alaska resident who spent your life going to school in Alaska and graduated, then guess what? If you choose to go to college, your tuition is paid for, along with in-residence living, books and everything you need to walk away with a diploma. If you drop out you obviously don’t receive anything more, as well as after graduation. The other option would be to use it to provide a better health care plan for Alaska residents. As a full-time college student and oilfield worker, I don’t think it is my responsibility to contribute to paying for people’s health care. The PFD could serve so many more beneficial purposes; we just need the opportunity to vote on them. Jeremiah Lewis is a process technology student at the University of Alaska Anchorage.